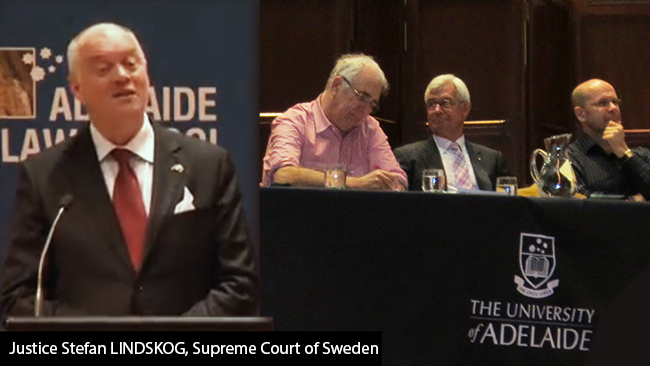 The Assange Affair, April 2013 – a public lecture by Justice Stefan Lindskog of the Supreme Court of Sweden, is streaming on the University of Adelaide website. Viewers are advised that the term “Affair” has largely been interpreted in the sexual sense. The sponsors decided not to live-stream the other panel members, Julian Burnside QC, Jack Waterford of the Canberra Times and Professor George Williams AO, all of whom brought a significant contribution to this debate. Of equal interest is the Q & A with the audience, wherein Justice Lindskog was faced with some challenging questions. He conceded that the robust Swedish judicial system he just promoted was powerless; not even consulted… when two Egyptian nationals, Ahmed Agiza and Muhammad al-Zery, were illegally rendered to Egypt and tortured. Sweden’s Ambassador to Australia Mr. Sven-Olof Petersson admits that he however, had advance knowledge of the CIA rendition flight from Stockholm on December 18, 2001. Doesn’t this undermine one of the central claims of the Swedish government and remove the need for extradition? And wouldn’t it also make the UK wonder why they had wasted 3 million pounds on keeping an eye on Julian? Britain might now consider sending the bill to the Swedish prosecutor’s office, since without their unjustified refusal to do what is legal and normal in such situations, the British could surely put their money to better use. Marcello Ferrada de Noli (Professor’s Blogg) has just published a comprehensive analysis of Justice Lindskog’s speech, in English, on the Swedish newspaper Newsmill. Audio only is available at this stage for the other speakers, but will be replaced by video in the near future. This entry was posted in ACADEMIC, LIVING PROOF, NEWS and tagged Jack Waterford, Julian Assange, Julian Burnside, Justice Stefan Lindskog, Professor George Williams, Wikileaks. Bookmark the permalink. There’s nothing to see or conspiracy to uncover here. The U.S. simply want Assange and will do what it takes to get him. Once there, he’s fucked. Sweden are the U.S.’s lapdogs and will jump as high as their ordered to. His only real recourse is to run as an Australian parliamentary member and thus get diplomatic immunity. Not only will that get him out of that embassy , but he will likely win a few seats! Good comment, but if elected, Assange doesn’t get diplomatic immunity. The Wikileaks Party have announced that they will nominate a member to take his place in the Senate if he is elected and still stuck in the Embassy. Sad, I know, but true.